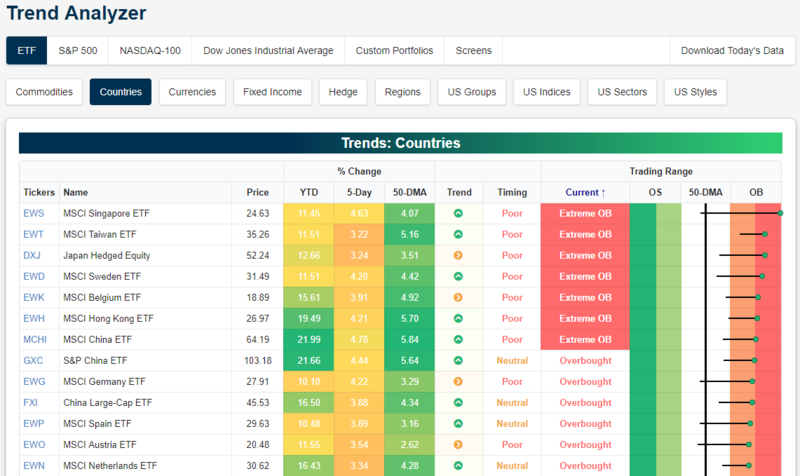 Below is a snapshot of the most overbought country stock markets right now using our Trend Analyzer tool (available to Premium and Institutional members). As shown, there are seven countries whose markets are now in extreme overbought territory, meaning they’re more than two standard deviations above their 50-day moving averages. 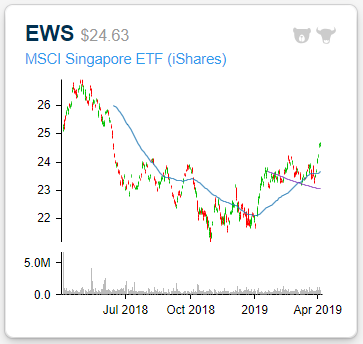 The Singapore equity market ETF (EWS) is the most overbought country right now as it’s three standard deviations above its 50-DMA. Other countries trading at extreme levels include Taiwan (EWT), Japan Hedged (DXJ), Sweden (EWD), Belgium (EWK), Hong Kong (EWH), and China (MCHI). Below is a chart of the Singapore ETF pulled from our Chart Scanner tool. While the ETF is at extreme overbought levels relative to its 50-day moving average, it’s still well below its highs from 2018. And while the ETF may be due for some short-term downside mean reversion, its breakout above resistance at $24 this week should set the stage for newfound support as it trends higher. This chart looks pretty bullish in our view.